But a GOOD yawn, no? 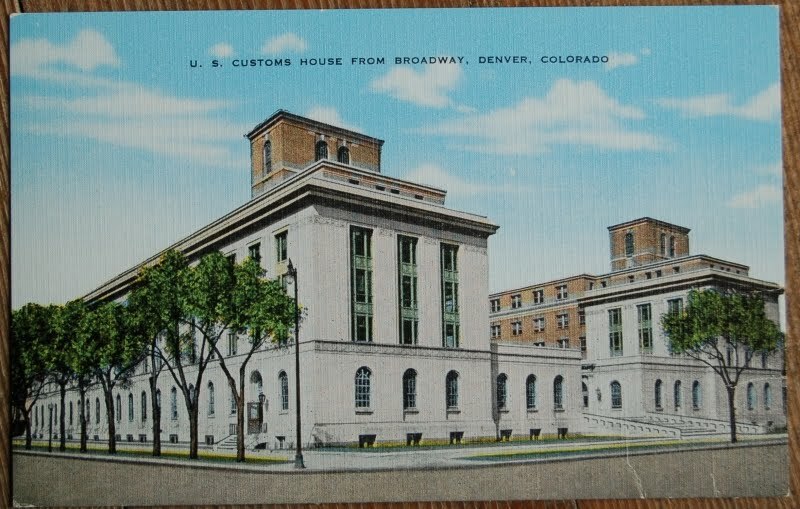 Why, oh why, is there a Customs House in (pause while I check back...I was so bored I did not register the city location)...DENVER? It's not exactly a border town. Husband suggests that mint is possible cause. Hmmm. Still seems obscure. Of course this was a major joke at the time (pre-WWII). The opposite view, from Arapahoe Street, would show the other edifice, in all its glory, bearing a striking resemblance to FLWright's brilliant "Falling Water" residence in Pennsylvania. One of the key structures of the Schizoid School of architecture, the customs house no longer stands, as it was torched some fifty years later in a drunken celebration after the Elway-led Broncos won the Super Bowl. The school spawned the entire so-called "That's My Bad SIde" Postcard movement, which caused bewildered bloggers -- most of a millennium later -- to blithely sort such priceless gems into the "boring" category, thereby missing one of of the best-kept secret jokes of Americana in the twentieth century. @KarmaSartre: I smelled so much truth in your architectural analysis I had to look it up. This is so totally the back side of the building. 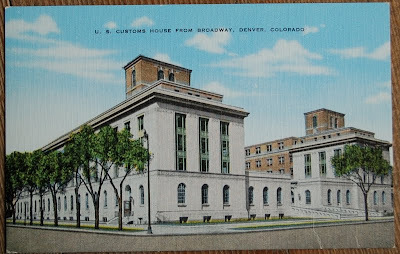 Most of what's shown in the postcard was a 1937 addition to the original building, which has a grand front entrance at the opposite end of the block. No drunken celebrations, but in 1975 a bomb in the men's room, allegedly set by a group called "the Continental Revolutionary Army." @mrs.5thousand: Your sources sound more reasonable. But, that's not my story and I'm not sticking to it.